Sakai Guides and DocumentationSakai Complete User Guide ForumsHow do I email a forum post author? This outlines the process of contacting an author of a Forum post by email. Typically, the email option is only available for instructors or site owners. This is an example of a Forum, bolded and in the largest comparative font. Click View Full Description to view more information about the Forum. This is an example of a Topic. 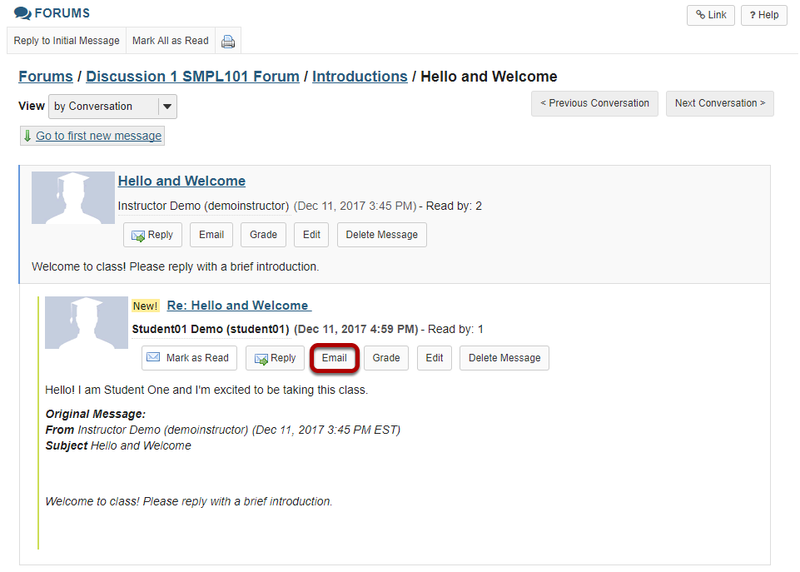 Select the Topic to view messages posted to that topic. Select a conversation, or thread by clicking on the subject of the post. Click Email below the author's name in order to email the forum post author. Next: How do I delete a forum post (i.e. conversation)?